With the arrival of the Fourth Industrial Revolution, what will economic growth look like in the future, and how will we measure success? “Our lives are being shaken to their very core by technological change, with the Fourth Industrial Revolution transforming economies as never before. No human being will be unaffected, either. 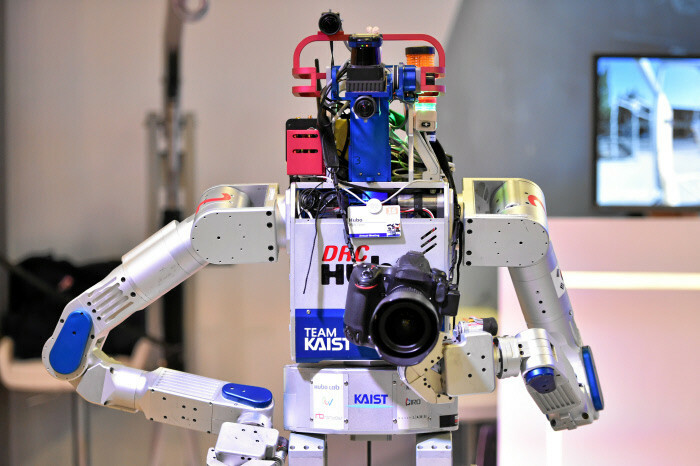 The Forum’s Executive Chairman and Founder, Professor Klaus Schwab, believes the implications for humans should be at the very heart of our strategy to navigate the Fourth Industrial Revolution. 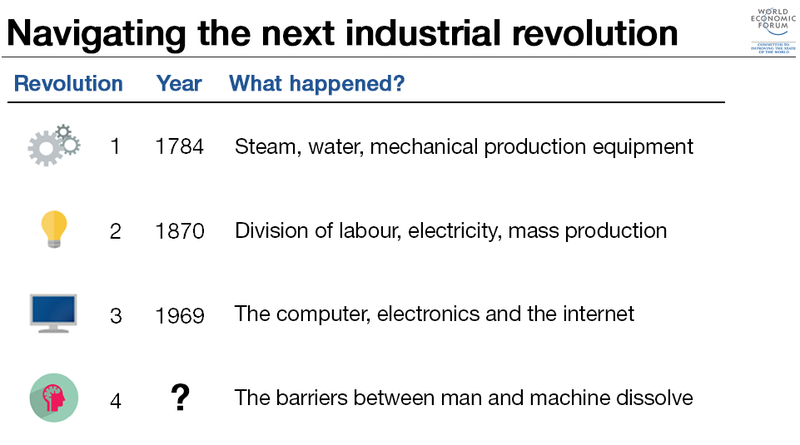 For more information on what the Fourth Industrial Revolution really means, read our explainer. “Amazing innovations not only create phenomenal opportunities for economic growth, but also serious societal challenges as well. Vast numbers of jobs will be replaced by machine intelligence and robots. The increasing capabilities of artificial intelligence and genetic engineering have the potential to get beyond the control of their creators. Are all these developments in technology positive? 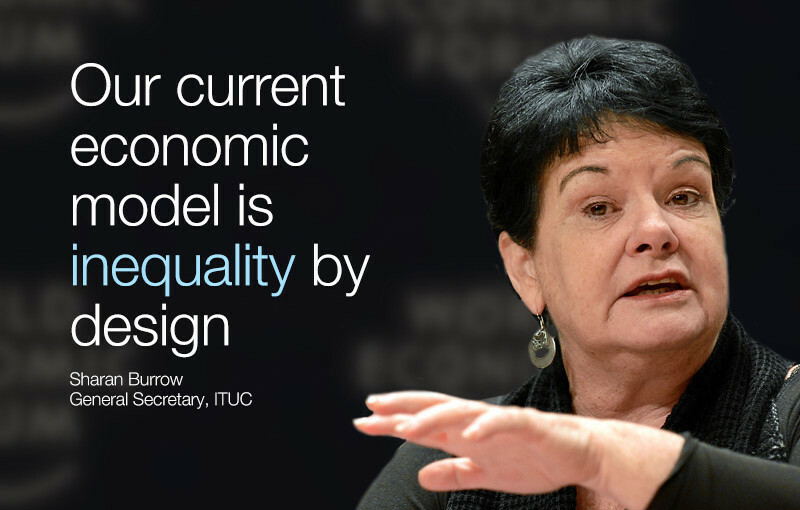 It’s not just about technology, says Sharan Burrow. We have being experiencing technological advancement for years. It’s the economic environment that it is grafted onto that is the problem. The global workforce is made up of 60% working in the formal economy, and less than half of these people have a secure job. Forty percent, meanwhile, work in the informal economy, with no rights or social protection, such as the minimum wage. The latter aren’t experiencing or participating in growth. And this isn’t counting the 30 million people who are enslaved, or the refugee crisis, conflicts and climate issues. So the central question is – can this technology be harnessed for social change? At the moment, the system of capturing growth for the 1% is not working. The commitment to a zero carbon economy is the future, but we need to make sure our prosperity is shared. Right now it is not, and we can’t just have more of the same. Is innovation contributing to job losses? “We are in a leadership crisis, not a technology crisis”, argues Benioff. We are in a tech revolution, and it’s not just robots and gadgets, but real advancements like CRISPR. This level of transformation requires severe and extreme leadership – strong leaders with a strong vision. Countries that are currently struggling are the countries with the weakest leadership. And if we don’t address this, we will see unbelievable amounts of poverty. Technology is never bad, says Benioff, it’s what we do with it. The biggest misconception, says Erik Brynjolfsson, is that technology is going to come for our jobs and there is nothing we can do. In many ways, he continues, tech can be useful at carrying out tasks that previously had to be done by humans, but there is a much better way to use it – to complement us and enhance human ability. Machines and humans have very different strengths and weaknesses, and there are many things machines can’t do that we can. At its very best, creative destruction is the best way to raise living standards for the many, not just the few. But so far we have not been doing very well. Even though the overall pie is bigger, technology has been used to create wealth for the 1%, not the rest. Burrow agrees. “We have a selfish economy,” she says, which drives wealth for wealth’s sake. We have lost sight of why we build economies in the first place – to create jobs for our sons and daughters. “A new model of business and economic development must ensure everybody's sons and daughters are treated as we would expect for our own. We have seen data used for good, and for bad. Where do we draw the line? One important question, Maurice Lévy says, is who owns the data? We know who sells it, but who owns it? There is also a divide between Europe and the US which needs to be addressed. The US is more open about its use of data, while European countries have been damaged by their strict rules regarding private data. Too much regulation is not a good thing, he argues. We need to put the people who are using, selling and providing data into a room together to ensure we can make reasonable use of data, otherwise we will have big problems. Are governments holding back progress? “You need a balance," says Brynjolfsson. Big data can create value but there are privacy issues. Some European governments have gone too far. Studies have shown that using data can add value to companies, so if we are too aggressive with regulation, we’ll do more harm than good. 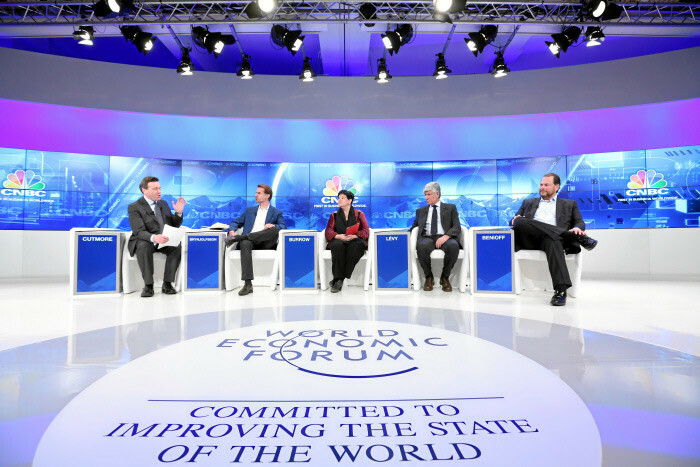 Nationalism is also slowing progress, says Benioff. We can’t afford for governments to throw up their hands and say, ‘we had no idea this was happening.’ We have been discussing technology at Davos for years. “Of course not,” says Brynjolfsson. The first step is recognising the problem, but I would also start with education. Inequality often occurs when there is a race between technology and education, and this is what we’re seeing right now. Education has to be fundamentally reinvented, stressing the things that humans are good at and machines are not; creativity, complex problem solving, literature, arts, relationships, caring. We should not just be teaching our kids to spit out facts. We are also taxing the wrong things, he adds. We should tax the things we don’t want, like pollution, and not the things that create prosperity and jobs. Machines that can perform cognitive tasks offer up huge potential, says Brynjolfsson. It’s easy to look at an existing task and think – let’s get a machine to do this for us. We’ve done this effectively, but we now need to be more creative and think about how a machine can make a human more valuable. This is rare, and requires real creativity. GDP, meanwhile, needs to be replaced. We must draw on big data and come up with a better system of metrics that fits with the advancements of the Fourth Industrial Revolution so we can make better decisions. 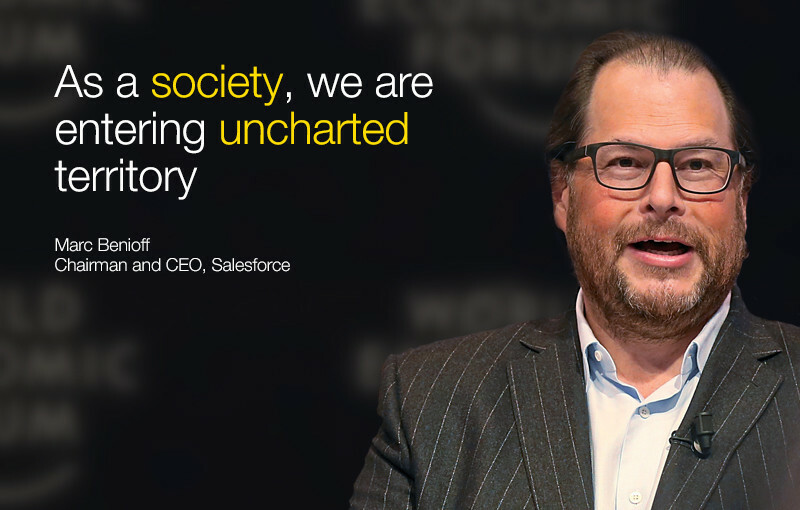 We suddenly have a huge opportunity to create equality, says Benioff. For women, the poor – everyone. But will we push the button? Good morning, and welcome to the fourth and final day of our Annual Meeting in Davos. Among today's sessions, we have The Global Economic Outlook with IMF Managing Director Christine Lagarde and British Finance Minister George Osborne. Then a little later we're looking at the top science trends for 2016, and what we can do to preseve our humanity in an age of technology. While you wait for today's sessions to begin, why not look back at what happened yesterday.